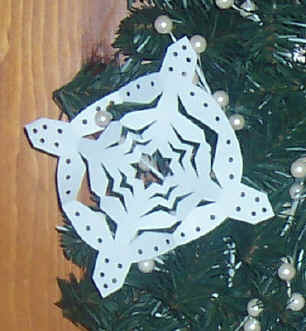 Make a Chrismon Wreath this Advent-Christmas season using our Chrismon Snowflakes' (right) or our Chrismon-Kids' patterns (shown below). Chrismon Wreaths are similar to Chrismon Trees in that you decorate the greenery using Chrismons* with white or white and gold decorations. White symbolizes God's holiness and purity, and gold symbolizes his majesty and glory. The greenery represents new life in Christ, and the circle of the wreath reminds us of God's eternal nature. 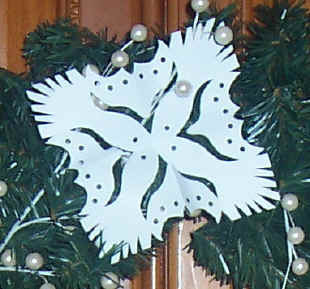 Watch a video of a Chrismon Snowflake being cut. * Christ-monograms or symbols of Christianity. 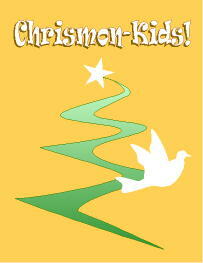 Click an ornament to enlarge it. Two Doves (shown on book's cover, below). 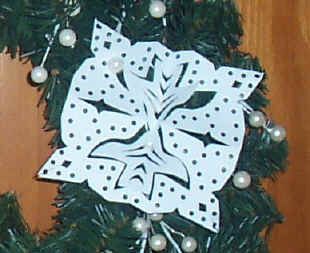 Chrismon Snowflakes for ages 9-Adult. Celtic Cross, Crown, Dove of Peace, and Star of David. 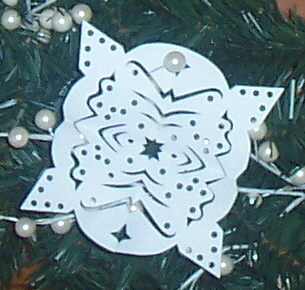 Click here to get a free Chrismon Snowflake sample ornament.